Lorena Poli Pinillos said she had no illusions about getting rich when she signed a contract to spend three months working in a Montpelier café in the winter — during her summer vacation. The 23-year-old university student from Lima, Peru, said she expected to make enough money to cover her travel expenses, plus maybe a little extra to see the United States. But Pinillos’ experience was anything but a vacation. Her contract, with an out-of-state company that sponsored her visa, guaranteed her at least 40 hours of work each week, or about $1200 each month. But Pinillos claimed that her Montpelier employer, Samosaman Café, never lived up to its obligation, and often gave her less than half the hours she’d been promised. Café proprietor Fuad Ndibalema also guaranteed Pinillos “suitable accommodations.” But she found herself among 11 foreign workers living in a five-bedroom, one-bathroom house in Barre City. Though men and women shared the house, Pinillos claimed, there were no doors on the bedrooms, and the bathroom didn’t have a lock. She said Ndibalema would often show up unannounced in the house and bedrooms. Pinillos expected to be “bunking” with another woman. She didn’t think that meant they’d be sharing one mattress on the floor. In another room, three women shared another single mattress. “Why am I supposed to sleep in the same bed with this woman? She’s a complete stranger to me,” Pinillos complained. “So I ended up sleeping on the couch,” she said. Pinillos’ allegations were echoed by those of three other Peruvian women interviewed for this story. All were employed by Samosaman until just last week, when a fellow Peruvian, now a permanent Vermont resident living in Franklin County, “rescued” them from their situation and took them into her home. The four Peruvians, all university students from Lima on summer break, expressed bitterness, disappointment and anger at the way they’d been treated in Vermont. Each said she paid more than $3000 for the opportunity to come to the United States under the federal J-1 Summer Work Travel Program, which allows foreign students to work here for as long as four months. According to a U.S. state department spokesperson, the program has exploded in popularity in recent years, growing from 54,700 participants in 2000 to 130,000 in 2010. The state department doesn’t keep track of where the program participants live and work. Nor does the Vermont Department of Labor monitor how many J-1 visa holders are currently employed in the state — though anecdotal evidence suggests many foreign students are coming to Vermont to work in the state’s ski resorts, hotels, cruise ships and other tourism-related businesses. It doesn’t always go well. A recent Associated Press investigation revealed widespread abuses in the J-1 visa program. Lured by the promise of well-paying jobs and the opportunity to live and travel in the United States, many overseas students fork over thousands of dollars to private, third-party brokers to provide them with work and housing, only to find they’ve signed up for overcrowded living arrangements and dangerous, potentially illegal employment. The AP investigation discovered that some J-1 visa holders were placed in strip clubs when they expected to be working in restaurants. Some student workers were paid less than $1 per hour, while others were forced to sleep in shifts because their housing accommodations were so overcrowded. Currently, two federal probes are investigating allegations of human trafficking related to J-1 visas. No one has made such harsh accusations against Ndibalema, himself a recent immigrant to the United States. 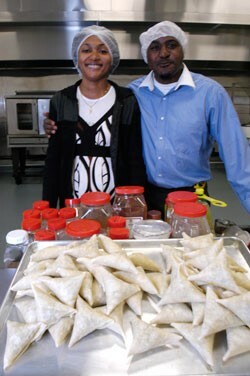 Ndibalema came to Vermont from the Republic of Congo with his wife and two children in 2000 and has grown a successful restaurant business, which has been profiled twice by Seven Days. He also appeared in the April 11, issue of Parade magazine last year, where his salary was listed at $222,800. Ndibalema, 39, denied virtually all the Peruvian women’s allegations against him. He did admit that their full-time employment arrangement “didn’t work out” because of his delays in opening a new café in Montpelier, where he’d expected them to work. That setback also reduced his need for workers in the industrial kitchen he operates in Winooski. Ndibalema claimed that, as soon as he realized there wasn’t enough work for the Peruvians, he contacted the agency that sponsored their J-1 visas — American Work Experience of Greenwich, Conn. — and asked that they be reassigned to another employer, or even another state. “A few of them had already left and went to other states,” he asserted, adding that it was his first experience using the J-1 visa program. The Peruvian women said Ndibalema’s inexperience with the program is no excuse for the way they were treated. They said he should have worked with their sponsor, AWE, to correct the problems. “We trusted the company that we were going to work with somebody with experience in this kind of exchange program,” said Naiara Preguntegui, a 20-year-old college student from Lima. “But when we got here, our employer told us it was the first time he’d ever done something like this.” Not only were the girls unable to work other jobs — they lacked Social Security numbers — but they had no transportation in and out of Barre and often resorted to hitchhiking to get to work and back. Preguntegui had many of the same complaints as Pinillos. Though her contract clearly specified that she’d get at least 40 hours of work each week, some weeks she spent fewer than eight hours at Samosaman. Her last paycheck, dated January 27, was for $19.20 for a two-week period. Ndibalema wouldn’t disclose how much he paid his employees, though his most recent pay stubs for the four Peruvian women indicate a rate of $8.15 per hour, which complies with Vermont’s current minimum-wage law. Ndibalema denied he charged the women anything for their accommodations, which he described as “very good”; he said he invested $16,000 in new furniture for the house in Barre City, which he owns. However, copies of the four women’s pay stubs, provided to Seven Days last week, reveal a $200 “cash advance” deducted from each one. When asked about the $200-per-person charges, Ndibalema explained that they covered the cost of utilities, including electricity, cable TV and Internet access. According to the Vermont Department of Labor, it’s illegal for employers to withhold more than $80 per month from a worker’s paycheck to cover housing expenses. An employer may charge more for housing, but it can’t be automatically deducted from the wages. Was $200 worth the price the women paid? A Barre City fire inspector visited the house in December after one of the residents filed a complaint. According to Barre City Fire Chief Tim Bombardier, the inspector found no major fire-code violations, but did confirm that a lot of people were living there. No citations could be issued, since Barre City has no maximum-occupancy standards for private homes. Ndibalema admitted that, for a “short time,” he had 11 employees living in the house at 39 Beckley Street. However, he denied that the bedrooms lacked doors and the bathroom had no lock. Asked whether his tenants were forced to share beds, Ndibalema just laughed. But the performance and compliance chief at the Vermont Department of Labor recently opened an investigation into Samosaman’s labor practices. She wouldn’t comment on her findings. Nicole Thompson, a state department spokesperson, said her office is aware of the systemic problems with the J-1 visa program and recently adopted an improved “vetting process” for employers who want to participate in it. The department has increased its monitoring of agencies that arrange for J-1 visas, of which there are about 1450 nationwide. Thompson said she was unaware of any specific complaints about Vermont employers. Shortly before press time, the Franklin County Peruvian woman who “rescued” the four young women last week notified Seven Days that Ndibalema had purchased four plane tickets so the women could leave Vermont. All four Peruvians left the state last weekend, but not before sharing their impressions of the time they spent here.